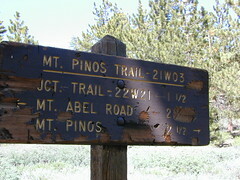 The Mt Pinos Recreation Area is located on the border of Southern and Central California, inside Los Padres National Forest. After passing Frazier Park, the winding, paved, mountain road starts atop Cuddy Valley and is approximately 12 miles from Interstate 5 @ Tejon Pass. The 8831′ peak is the tallest in Kern County and is a popular spot for both summer and winter recreation: cross country skiing, snow shoeing, backpacking, hiking, mountain biking. The snow gates often close during heavy snow. Mount Pinos Road starts atop Cuddy Valley Rd, at the “Y” – where it intersects with Mil Potrero Highway, which heads out to Pine Mountain Club, California. One mile up the Mount Pinos route, you will find McGill trailhead on the right side (it is popular w/ mountain bikers) and then the first snow gate at Burbank Rd. Another 4 miles up hill, you come to the only set of dirt roads accessible on this range. A left turn will take you winding thru pine forest to the valley below. 4×4 is not required, but a National Forest map is very handy. Unfortunately all the private properties at the bottom have locked gates & no thru access to Cuddy Valley is allowed, but it is an awesome drive to just go exploring in the woods. Back on the main route, shortly after the dirt roads is McGill Campground on the right side & another snow gate. 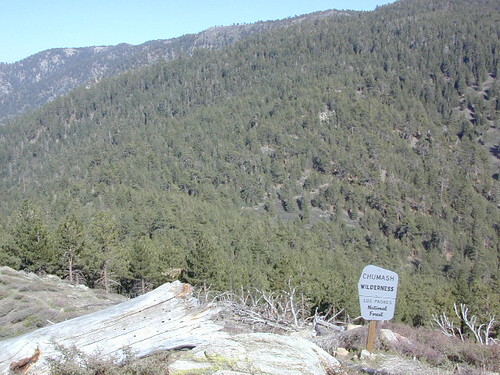 In another mile and a half you will reach Mt Pinos Campground on the left side; the entrance is easy to miss. From here you are less than 2 miles from the end of the main road. The huge paved parking lot is the dead end (2 miles from the peak of Pinos) – very popular with astronomers, mountain bikers, plus the families and snow sledders in winter (if the gates are open). A National Ski Patrol’s Nordic Base, the only building you will see up this way. At 8300′ elevation, the large parking area is perfect overnight spot for amateur astronomers, so be considerate when visiting night. New moon (no moon) weekends APR-OCT are optimal viewing months. In busy summer months you can often find motorhome campers all set up with expensive equipment tracking the heavens all night long. Please be respectful of their hobby & eyes; Turn off headlights when you approach the parking area at night. There is also a hike-in, freebie camp ground called Chula Vista; an easy quarter mile walk from the parking lot to 12 camp sites & a pit toilet. Mountain bikes dig this area too. A large meadow here blooms with wild irises in summer, only sometimes. The trailhead for Pinos Summit starts at this parking lot. It is a 2 mile moderate, but steep hike on an old fire road. The neighboring peak to the west is called Mount Abel @ 8286′ elevation (aka Cerro Noroeste). The infamous peak to peak hike along the ridge line from Mt Pinos to Mt Abel is 6.5 miles one way – and very popular in summer months. 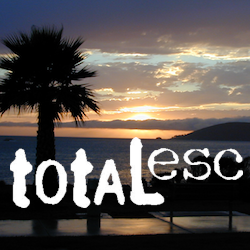 This hike requires 4-6 hours & a car shuttle should be arranged in advance. 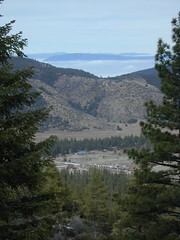 The Chumash Wilderness sits between Mount Pinos and the tiny community of Pine Mountain, which can be seen below on many places along the hike.